Old postcards from the library’s History Collection are on display in the lower level Gallery at the Main Library. The exhibit will provide a walk down memory lane for those who remember the good old days in Great Neck. These postcards, some going back to the early 1900s, are notes to and from people who lived on the peninsula. For decades, postcards were equivalent to today’s Instagram. The photos on the front captured a glimpse of something of interest, with a brief description on the back. 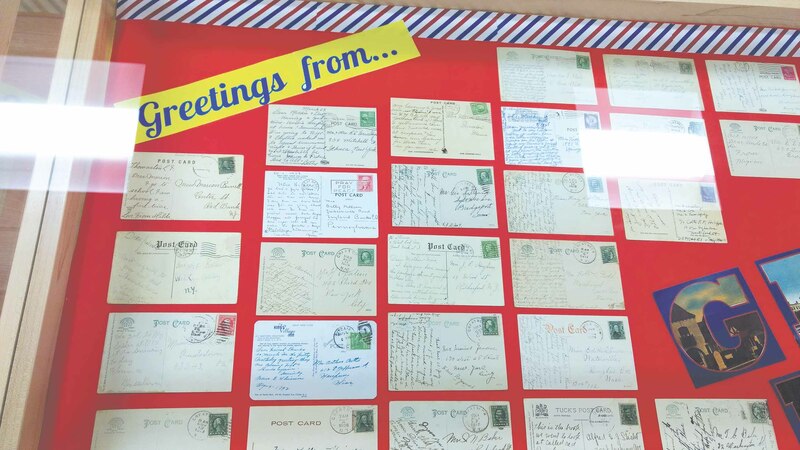 Postcards had enough space, but letter writers had to scrawl teeny-tiny characters, to say they had a wonderful time and wish the recipient was there; similar to the 140-word count of Twitter. And, because good manners, taught the sender to only write nice things; it was a postcard after all and everyone who handled it, from the time you dropped it in the mailbox until the time it was delivered to its intended recipient, would read it, out of sheer nosiness. Postcards were intended to be collectors’ items and have proved to be that. There are ephemeral conventions and clubs and museums created around the 3-by-5-inch pieces of card stock. The cards are collected for the images, postmarks, stamps or for the charm of the script itself. Cursive? Writing and reading cursive seems to be a special talent nowadays, so it’s a bit of an adventure to decipher what others have penned in their succinct communications. Views could easily spend hours marveling at the penmanship. The Great Neck Library holds more than 400 postcards related to the peninsula’s history and its neighboring communities, dating back to the early 1900s. The images of local architecture, community highlights, events and daily Great Neck life are featured on some of these cards. Visit New York Heritage at www.nyheritage.org and type Great Neck Historic Postcards to view most of the collection. View a small sample in person at the library in the gallery showcases through the beginning of October. Make an appointment for a special viewing at 516-466-8055, ext. 241. This month’s postcard exhibit was curated by Christy Orquera, the library’s history custodian.